Have you ever bought a T-shirt with an awesome design printed on it, that you just had to have? Perhaps at a concert, sporting event, or while out shopping. Chances are you paid a pretty penny for it if you did get it from an event, or a top-shelf clothing store. You wore it proudly, and likely, frequently. However, after you got it, and put it through the laundry a few times, you noticed that awesome print had begun to crack. Or maybe chips and layers of ink started to peel off from the shirt. That’s always a real let-down when it happens. Greetings everyone. 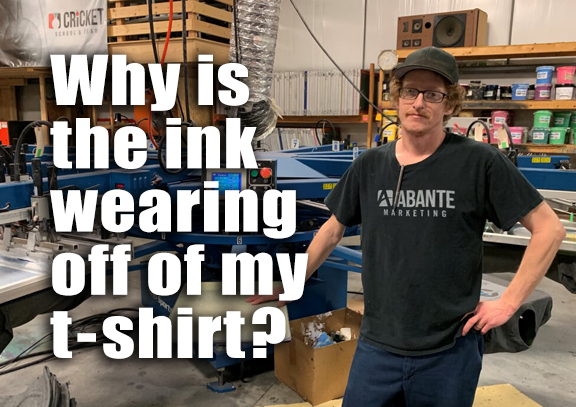 My name is Tom Blinde, and I’m just one of a group of talented printers/technicians here at Abante Marketing. I’ve been working in the garment printing industry for about 20 years now, in just about every capacity aside from being a sales person. I’m here today to give you some quick tips on how to check for proper ink cure on shirts and other wearable items that you’ve purchased. Most screen-printed apparel produced nowadays use a type of ink called plastisol. It is essentially a thick, yet liquid, plastic-like compound that fully cures to a solid state anywhere between 250 and 325F degrees, depending on the ink used. This is typically done with a conveyor type of oven. (Think commercial pizza oven.) Screen printers who truly take pride in their work will take care to be certain that the prints they produce not only look great but are also properly cured to assure a durable print that will last. The most common cure-defect you’re likely to come across is an under-cured print. This usually happens because of one or a combination of issues, such as: too low of a temperature setting on the curing oven, too fast of a conveyor speed used, a defective or poorly performing oven, and even excessively strong or cool air currents moving through a given shop. Regardless, if a printer monitors cure temperature properly as they should, these issues will be addressed before the product gets to you. However, I’m sure you’ve noticed that, nowadays, quality control can be a bit hit and miss in just about every niche of retail-goods. When it comes to spotting these defects when a shirt is new, there are a couple of helpful methods that you can use to determine sufficient ink cure. The first method is what’s called a stretch test. This method works great on prints done on darker colored garments that are cotton or a cotton-poly blend, where a print under-base was likely used. An under-base helps colors remain vibrant and unaffected by the darker dyes in the garment. It also makes the print perhaps a bit thicker feeling as well. A stretch test is perfect for prints like these. As the name implies, you’re going to take a small section of the print and stretch it moderately, looking for cracks to emerge in the ink. You simply pick a spot on the print, (best done in the middle of the print if the print field is large and solid) and using your thumb and fore-finger on each hand spaced about 2 inches apart, pinch down on the garment and stretch it laterally. (Side to side). Apply the stretch gradually and smoothly until you’ve stretched the spot on the print about one-and-a-half times the original width that your thumbs were spaced before stretching. If the print is under-cured, vertical cracks will appear as you stretch. When the ink is under-cured on a garment, its is possible to re-cure it until it reaches a proper cure point. If you had custom apparel printed, be sure to voice your concerns with your printer, and request them to re-cure the goods if you haven’t laundered them yet and time permits. However, be careful utilizing this method because once a print is cracked, re-curing it won’t fix it. 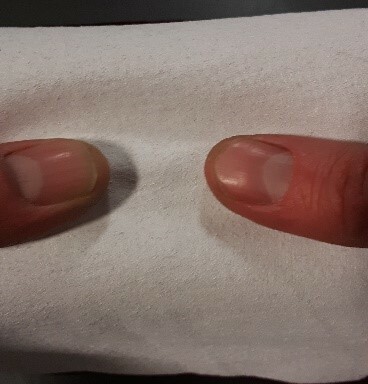 Figure 1:With thumbs spaced about an inch apart before stretching. Figure 2: Stretching 1.5-2 times the original space between thumbs. The cracks indicate this print is under-cured. Figure 3: No cracks from stretching shows this print is sufficiently cured. A different method that works better for non-under based ink deposits on lighter colored garments is called a crock-test. 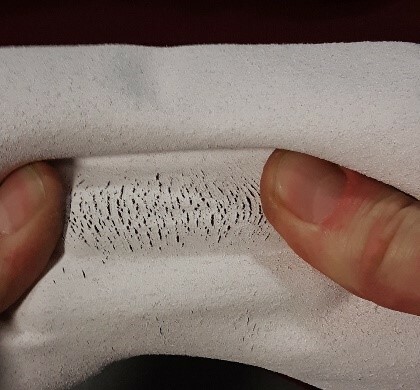 This is where you take a light-colored piece of cloth, like a piece of white cotton t-shirt, and rub it vigorously on a small, select spot on the print for a period of about 30 seconds. Make sure to lay the shirt on a hard surface as you do this. After 30 seconds, look at the spot on the piece of light cloth you used to rub the print. It should still be its original color and not have picked up any color from the ink after being rubbed. If there is color picked up, it’s under-cured. You may also likely see a dulling of the ink on the print where you rubbed. Again, the ink may be re-cured to fix the problem. This method may not be very handy when you’re out shopping, looking at stuff off the rack, but you can do it when you’ve had garments custom printed. 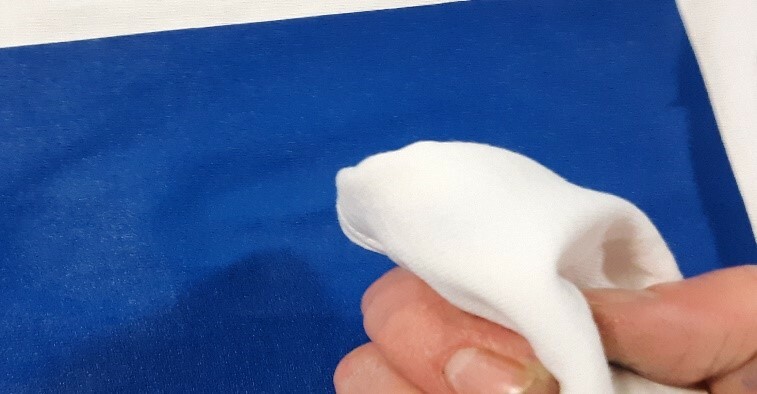 Figure 4: With the crock test, after vigorously rubbing the print, the blue color on white cloth indicates the Royal ink isn’t sufficiently cured. Note the dull or lightened area of print as well. 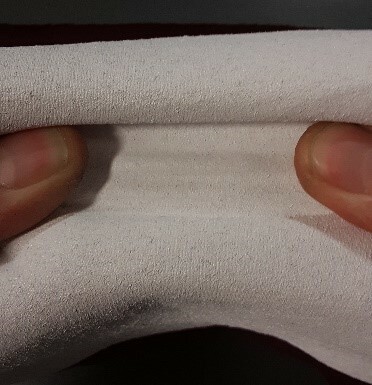 Figure 5: The clean white cloth after rubbing indicates the print is properly cured. Ultimately, the final and most telling test of all, is how the print holds up after being laundered multiple times. Granted, this won’t tell you at the point of purchase, or maybe even soon after, if your print is poorly cured. However, it can help guide you in the big picture of deciding to stay with your current garment decorator, or favorite clothing brand, and when perhaps to shop elsewhere when your next project or purchase comes around. If you have printed garments that you’ve had a while, wearing and laundering with regularity, and they still look great many months or even years later, you know whomever did it made sure it was cured right. Always wash screen-printed garments inside-out to help avoid wear or damage to the print. One last cure defect I want to bring up is over-curing, or excessive heat. This tends to be most problematic on dark-colored garments. When a dark-colored garment is run through an oven, the dyes in the garment begin to vaporize and sometimes can cause the ink color(s) of a design to shift and be tinged in whatever color the shirt is. This phenomenon is called dye-migration. Most inks nowadays, with proper under-basing and cure temps, practically eliminate this from happening. If excessive heat is used in the curing process though, even the best inks won’t prevent this from happening. For instance, a plain, bright- white print on a red garment (one of the most notorious garment colors to dye-migrate) can appear with a pinkish hue after curing if excessive heat is applied to the print. Some types of Performance-Poly and blended fabrics are particularly sensitive to this. If your prints look tinged by the shirt color, excessive cure heat is likely to blame. Well, there you have it. I hope I’ve not been too long-winded with this, and I also hope it’s given you some good information to help you make smart choices when it comes to the printed apparel you purchase. Thanks for reading!